Me, Tar-fan As a child, we are fascinated by the simple glory of the heavens and the earth around us. As a youth or young adult, we have little to no time to see anything but the task ahead of us to succeed in our work and rearing of our offspring. Thankfully, I survived both and now I am nearing the sunset of my life and once again I find myself slowing down and being amazed at the world around me. It doesn’t really bother me that I don't understand much more than I did when I was a child. I am drawn back to reexamine what thrilled me as a boy. I loved old Roy Rogers' western movies, and the genius of film comedians Charlie Chaplin and Buster Keaton. Superman, Batman and other modern myths still give me pleasure to this day. I am grateful that the heroes of my past were good guys and honorable. This brings me to Tarzan. I am a fan of Tarzan. As many Star Trek fans refer to themselves as "Trekkers," I have dubbed myself as a "Tar-fan." In the making of the documentary film and writing this book by the same name, I am combining two passions: Tarzan and silent film. Since the beginning of this project, I have been amazed that nearly everyone I meet from young to old know about and have a favorable impression of Tarzan. 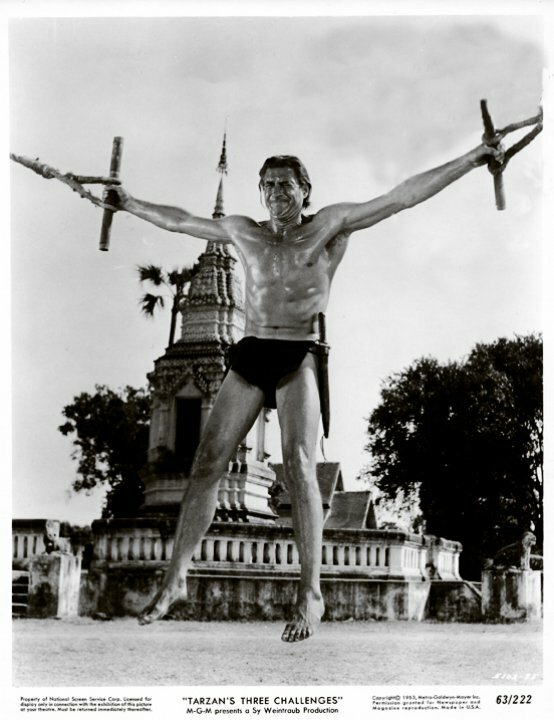 Most have an ape-man story and most like the Johnny Weissmuller motion pictures the best. Many times when I order food or coffee and have to give a name to let me know when my order is ready, I give the cashier the name "Tarzan." This usually brings on a yodel from some staff member or a question of why I give that name. I believe in marketing in mass or with one individual at a time. I tell them about the film and to be looking for it. I believe that everyone is connected to other people and somewhere along the line they know someone who likes Burroughs. My introduction to Tarzan was through the Weissmuller films. I loved them. In the early 1960s, we had Tarzan films shown on TV every Saturday morning. They showed all of Johnny's films along with Lex Barker and Bruce Bennett. When those had been shown over and over, the station added Bomba and Jungle Jim to the mix. For most of my childhood, my town of Bossier City, Louisiana ended at my backyard. There were cotton fields as far as one could see to the north of our property. While there were no trees, those fields served as the "dark continent" of Africa for my neighborhood friends and me. The last spanking my dad ever gave me concerned Tarzan. The cotton fields were being developed into subdivisions. The surveyors put out wooden stakes with little red plastic flags tied to them to show where the house lots and streets would be. The stakes were the perfect length and weight to be Tarzan spears. We launched those "spears" at imaginary lions and bad guys. At the end of play, we all dropped our collection of spears at the back of my family's property. My Aunt Gertrude lived with us at the time and she needed stays for her tomato plants. The surveyor stakes and our spears looked like tomato stays to her for the garden. She collected them and put them in our storage room to wait for spring. My dad was in the construction business. He knew how hard it was to survey a subdivision. He had told me when the surveying had just begun to leave the stakes alone and naturally, I had forgotten his warning not to bother those stakes. Actually, I didn't think I'd get caught disobeying. Sin has always come pretty natural to me and never worked to my benefit. That very afternoon, my dad came home from work and instead of going into the house; he went straight to the storage room. Upon seeing the stakes, spears, stays, he gave the cry of the bull ape. His was not a Tarzan yell "Tar-Mangani", or the MGM or RKO yodels either. Rather, his usual yodel went something like, "Alllll-llllan!" The jungle (cotton fields) fell silent and I knew escape was futile even though I didn't know at that point which of my many infractions I was being summoned for. My spanking didn't really hurt. Putting an abrupt end to my deviant behavior was his intent and not bruising me. 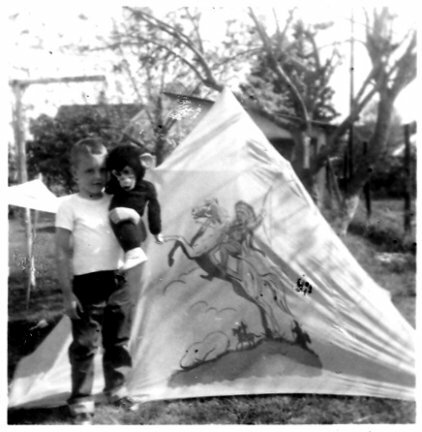 My next experience with Tarzan came in the early 1960s. The buzz around Bossier City and Shreveport was that the "real" Tarzan was coming to town to present his new movie. All the kids were ecstatic. I couldn't wait. It was on a school night but that didn't deter anyone. We got to the Don Theater in downtown Shreveport and waited in a long line. The theater workers passed out 5"x7" black and white glossy photos of Jock Mahoney as Tarzan. While we waited in line, we discussed how Tarzan would look and what he would do. It was a given that he would be wearing his signature loincloth and trusty knife. After all, they were prominently displayed in the photo we were handed. We were all in hopes that he would swing onto the stage on a vine. The logistics of how that could actually be done never entered into our thought processes. With Tarzan, anything was possible. We were fortunate to find seats near the front of the theater. This was probably because most people had enough common sense to sit further away from the screen. Finally, the theater manager came out and introduced Jock Mahoney the star of Tarzan's Three Challenges. We waited with baited breath. Entering from behind the curtain at stage right, Jock Mahoney, Tarzan of the Apes, came walking out in a brown three piece suit and tie. He never looked at the audience as we screamed our appreciation for his presence. He walked across the stage, looking straight ahead half-heartedly waving at the clamoring crowd and exited stage left, never to be seen again. His pace seemed to demonstrate some need to get to the other side of the stage with haste. The lights went down and the film began. Not long after the movie started I got over the shock and I thrilled to the color adventure. I couldn't believe that the actual Tarzan had taken his valuable time to leave the savage jungle to come to Shreveport, Louisiana and walk across the stage of the Don Theater on Crockett Street. We weren't worthy. In my research for this documentary, I learned that in the making of that film, Mr. Mahoney had become extremely ill and was still suffering from the effects of his sickness when he "passed through" Shreveport. Tarzan's Three Challenges is still one of my very favorite Tarzan films. For my next intersection with the noble savage, I jump ahead to when I was about thirty-five years old. I had become good friends with Al Hartley who wrote and drew Archie comic books for about twenty years. He was a great source of encouragement to me as I was trying to get published as an author and illustrator. One night I received a phone call from a publisher named Hugh Barbour. He had contacted Mr. Hartley about illustrating some coloring books for his company. Al was covered in work and he recommended me to Hugh. During our conversation he asked if I had anything else he might be interested in seeing. I told him that I had a superhero character named Zaanan that had been turned down by everyone. He didn't hang up, so I briefly described the character and said that I thought it would fit perfectly in a format known as a "big little book" or "better little book." These books were small books published as early as the 1920s that had a page of text followed by a page of illustration. Hugh was interested. He said that when he was a boy, his favorite book was a "big little book" version of Tarzan of the Apes. He was intrigued and asked me to send information on the Zaanan character and a "big little book" if I could find one. I overnighted the info to him and he called me a day later. He loved my character and the concept. He said he had decided to introduce an entire line of these type books. He would take on the Zaanan character if I would illustrate the books for him and do the coloring book too. 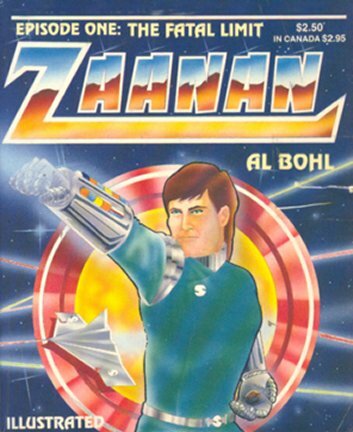 We came to an agreement and I ended up writing four Zaanan books for Barbour and Company and illustrating at least thirty books, numerous coloring books and designing lots of book covers for him. This was a time when people ran companies instead of committees. Tarzan of the Apes really came through for me. After I graduated from college in my early thirties (I crammed four years of college into eleven years), I decided I wanted to be a book illustrator. Of course, comic books were of interest to me. This was all at a time when "funny books" were reaching a new popularity. I began reading a lot of comics. My kids really liked this phase of my life. They enjoyed the comics and the conventions we attended. It wasn't long before I came across the Joe Kubert Tarzan comics. As a kid, I had enjoyed the Tarzan comics but Joe captured the look of the character. I personally believe that this version of the character should be the model for finding the next film Tarzan. I would also vote for the actor who played the character called Sawyer on the TV show "Lost." I collected all the Kubert Tarzans and the Marvel version of the day too. Kubert held a weekend comic book art workshop in Nashville, Tennessee and I attended it. His boys Adam and Andy were there also. I brought with me the giant-sizedReturn of Tarzan comic that Joe had done. I asked him to autograph it. He took the book from me and opened it with reverence. He signed it and commented how much he loved that comic. My final personal story relates directly to this documentary film. I was eating breakfast with a group of men at a hotel in south Louisiana. For seemingly no reason, one of the men named Wayne Jenkins volunteered that he had lived in Morgan City, Louisiana for a while and that it was the place where the first Tarzan movie was made in 1917. Wayne went on to say that apes and monkeys were brought in to make the movie and it was believed that when the movie was over the apes refused to get back in the cages and were left behind. My ears perked up at the word Tarzan and I was instantly intrigued at the thought that apes and monkeys might be living in Louisiana. This really hooked into my mind and I wondered for a good while about those monkeys. Whenever my wife Doris and our three kids drove across the long bridge section between Lafayette and Baton Rouge I would remind my kids about the monkeys being in the swamp jungle we were passing through. Their faces would be glued to the car windows straining their little eyes to see if they could catch a glimpse of a monkey. Finally, along comes the internet and while traipsing through the world-wide web one evening, I decided to see if there was any information about monkeys living in Louisiana. This took me to the website www.erbzine.com. As you know, the Illustrious Potentate of Webmasters is Bill Hillman. I stand in awe of Bill and his wife Sue-On. At this site, I was introduced to tons of information about this first Tarzan movie and found it to be surrounded with amazing facts and unanswered legends. For instance, whether apes or monkeys were filmed in Louisiana and left behind. So, the trail has led me to this point. I have been asked which of the Tarzan books and movies are my favorites. Well, my very favorite book is Tarzan of the Apes. I have read it numerous times and studied it line by line. I am listening to it on tape now and loving every second. I will continue to read it as long as I live. Two others really stand out to me. They are Return of Tarzan and Jungle Tales of Tarzan. I like the continuation of the first story offered by Return but Jungle Tales gives more stories of the "forest god" and seems to be more about the internal life of the character as he questions why life is what it is. I know from my research that most seem to feel that Tarzan and His Mate is the best ape-man film ever but I believe my very favorite film is Tarzan's Greatest Adventure with Gordon Scott. I recall seeing it as a boy at the Don Drive-in Theater in Bossier. This is a different Don theater than I saw Jock Mahoney in. I feel that Greatest Adventure still holds up and is very exciting. The main bad guy is a really good actor and the wire noose is a threatening concept. My second favorite film is Tarzan of the Apes. I have studied this film over and over and watched it many times. I have written about every second and every scene. Considering the time it was made, I am tremendously impressed with the film that remains. Watching it closely for at least a dozen times or more, there are a lot of elements portrayed in the film that are lifted right out of the book. I know that most people I have spoken with are not wild about Elmo Lincoln by saying that Burroughs liked Stellan Windrow better, but I think the only thing about Lincoln I didn't care for was the wig he wore. That was more of a wardrobe problem than a heroic look. He had a strong but kind face. He was believable when angered and his face would light up with happiness. I could see him being better able to shoulder a treasure chest full of gold as in the book where it normally took four or five normal men to carry. My next fav is the Disney animated film. The best part of that film is how they told the entire back story during the duration of a song. Finally, my fourth favorite film is (surprise) Tarzan's Three Challenges for what should be obvious reasons. Mahoney's version was strong and thoughtful. I know he is older but this Tarzan I could see feeling at home in a dress suit (three piece) or in a loincloth. It looks like he did his own stunts. There is one scene when he is waiting on the bad guys to fall into his trap. We see him standing up in a tree eating a piece of fruit and acknowledging a monkey without even looking at the primate. In that moment, he IS Tarzan. Now that I know that he was sick during filming I have paid better attention to the film. As I watch it, I can see that he is dropping weight and looking grave, but his actions never betray human frailties. As in the Burroughs books, Mahoney's Tarzan rushes to the danger convinced that he will be victorious. Did I tell you that I once saw Jock Mahoney -- in person?